This is a pretty cool summer salad- the kind you might get from some hip downtown LA restaurant in Abbot Kinney- light, full of crunch, colour and flavor. 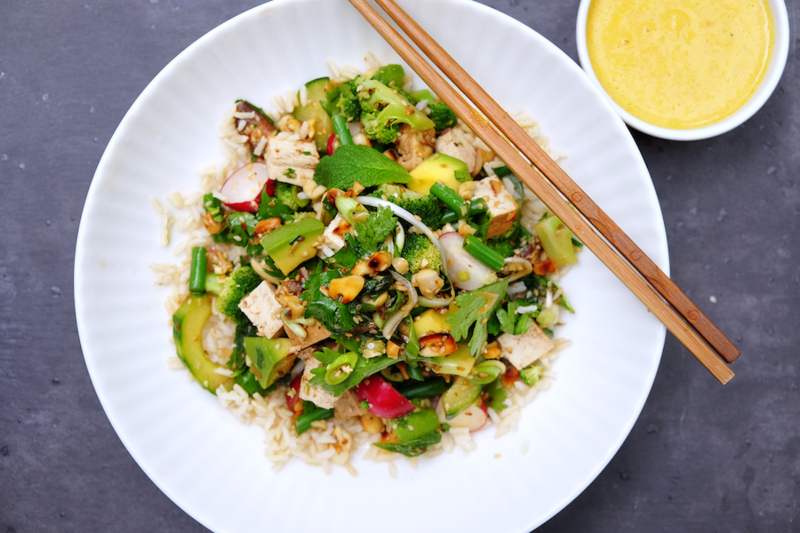 The term ‘superfood’ is overly used, but all the same, we like to think of this creation as our killer Asian-inspired superfood salad, enriched with avocado, broccoli, seeds and nuts, sugar snaps, brown rice and marinated tofu. Really there are no rules with a salad like this; Noodles can be substituted for rice, prawns for tofu. In an English July, seasonal choices are endless – with our vegetable garden in full swing, this week in Somerset we have been using lots of broad beans and sweet peas. So always try to pick what looks ripe and abundant from your local greengrocer. This carrot miso dressing was inspired from a favorite east village, NYC, restaurant- Angelikas. Quick and healthy lunches are on most street corners and avenues in Manhatten- something we miss from our stomping days there. You are promised, from most places, delicious and healthy grub, with excellent service and a vibey atmosphere. It really is a foodie capital on speed. Angelikas on east 12th blew our culinary mind aged 23, being able to get a quick takeaway lunch box that was both nourishing, filling and seriously good- this was the dragon bowl that came with tofu and a sauce of your choice (mine was always the sweet gingery carrot one). This Sauce is easy to make, just wiz everything on a high-speed blender. We would recommend this as a dressing for crunchy salads, noodle dishes or even grilled meat and fish. Adding more water for a lighter dressing or less for a tasty sauce. Tofu can be slightly typecast as a hippie hairy ankle dream, but we can guarantee that even boyfriends to dads will be enjoying this, being the perfect sponge light and silky sponge for a punchy and tangy marinade. Marinate the tofu by making sure you get most of the water out of the tofu by pressing it in kitchen towel, then cut into 2cm cubes and marinate for at least an hour. Blanch the broccoli, so its still crunchy and then mix together with the other salad ingredients. Divide the rice between your bowls, top with the mixed salad. Sprinkle the seeds over the top and added coriander. Drizzle the marinade dressing over the top. Serve with the carrot dressing.